As silly season approaches in media-land (August is notoriously slow for news), you can bet your bottom dollar that there will be at least one story doing the rounds about breastfeeding in public. Well, I've got news for you. I appeared live on Sky Sports 1 over the weekend while I was breastfeeding three month old Baby O. And do you know what? No-one batted an eyelid. Because breastfeeding...IS NORMAL! OK - so it was a fleeting glimpse. Blink, and you miss it (ah, the beauty of Sky Plus and the pause button). And, to be honest, if I hadn't said what I was doing, you probably wouldn't have noticed. But - that's the point. Virtually every week there is a furore in the media somewhere about a breastfeeding woman being asked to move or to stop breastfeeding. I mean, we even have legislation making it unlawful for people to discriminate against breastfeeding mothers (the 2010 Equality Act if you want to look it up). And that makes women scared to breastfeed in public. Some may go to great lengths to avoid breastfeeding in public opting to spend time and energy they may not have expressing (only to get grief for bottle feeding!). It can all be a bit stressful. 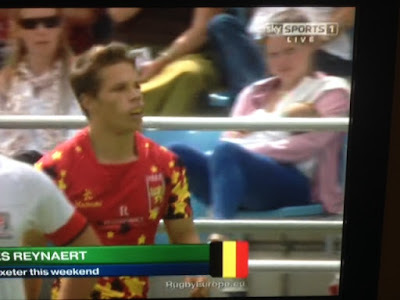 Well, I am pleased to report that I sat all day in the front row of an international rugby event - the European Rugby 7s at Sandy Park in Exeter - and received no comments at all. No-one batted an eyelid. And yes, I even got caught on live TV and still no-one noticed. Because actually, breastfeeding is quite a normal thing to do. And it's pretty easy to be discreet without hiding you or baby away in a back room (or worse, a toilet). Back in the real world, there are lots of women who breastfeed in public everyday. They're not flashing their nips to the world and they're bringing attention to what they're doing by draping a huge curtain over their youngster (although, if a cover makes you more comfortable, go for it). Double layer - wear a vest underneath your top so when baby wants to nurse you lift up your top layer and drop down the vest. This means the top layer covers the top half of your chest and the vest prevents the world from seeing your post baby mum tum. Don't wait to find a more convenient place. Try and nurse your baby as soon as they start showing signs of hunger. People are more likely to turn around with a frown to investigate why that baby is making a noise if it is crying. If you can start to nurse before your baby begins to fuss, then people won't even realise baby is there, let alone breastfeeding. Wear a sling - once you get the hang of breastfeeding, try nursing in a sling - that way you can carry on walking round the supermarket while your baby feeds and no-one will be any the wiser. The only issue will be when your other half realises you can now multitask while breastfeeding so you're days of lounging on the sofa because you're nursing the baby might be numbered! Smile - If anyone looks over, flash them a grin to reassure them that what you are doing is perfectly normal and to disarm them if they were even thinking of saying anything remotely negative. Breastfeeding in public is not all or nothing. You don't have to flash any flesh and you don't have to hide in the toilet or under a blanket. It's just part of bringing your baby up. What tips do you have for breastfeeding in public?